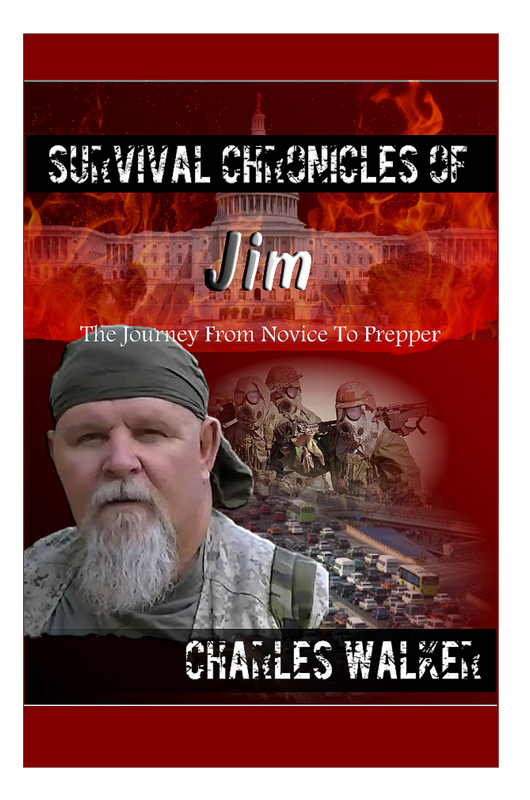 For an unarmed survivor or evader, or when the sound of a rifle shot could be a problem, trapping or snaring wild game is a good alternative. 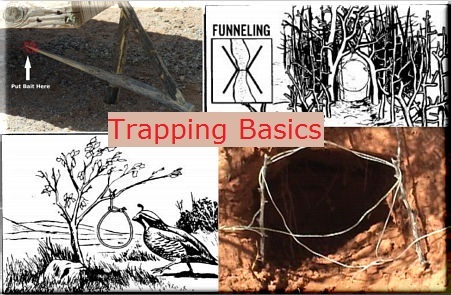 Several well-placed traps have the potential to catch much more game than a man with a rifle is likely to shoot. • Be familiar with the species of animal you intend to catch. • Be capable of constructing a proper trap and properly masking your scent. • Not alarm the prey by leaving signs of your presence. There are no catchall traps you can set for all animals. You must determine what species are in the area and set your traps specifically with those animals in mind. • Chewed or rubbed vegetation. • Nesting or roosting sites. • Feeding and watering areas. Position your traps and snares where there is proof that animals pass through. You must determine if it is a "run" or a "trail." A trail will show signs of use by several species and will be rather distinct. A run is usually smaller and less distinct and will only contain signs of one species. You may construct a perfect snare, but it will not catch anything if haphazardly placed in the woods. Animals have bedding areas, water holes, and feeding areas with trails leading from one to another. You must place snares and traps around these areas to be effective. If you are in a hostile environment, trap and snare concealment is important. However, it is equally important not to create a disturbance that will alarm the animal and cause it to avoid the trap. Therefore, if you must dig, remove all fresh dirt from the area. Most animals will instinctively avoid a pitfall-type trap. Prepare the various parts of a trap or snare away from the site, carry them in, and set them up. Such actions make it easier to avoid disturbing the local vegetation, thereby alerting the prey. Do not use freshly cut, live vegetation to construct a trap or snare. Freshly cut vegetation will "bleed" sap that has an odor the prey will be able to smell. It is an alarm signal to the animal. You must remove or mask the human scent on and around the trap you set. Although birds do not have a developed sense of smell, nearly all mammals depend on smell even more than on sight. Even the slightest human scent on a trap will alarm the prey and cause it to avoid the area. Actually removing the scent from a trap is difficult but masking it is relatively easy. Use the fluid from the gall and urine bladders of previous kills. Do not use human urine. Mud, particularly from an area with plenty of rotting vegetation, is also good. Use it to coat your hands when handling the trap and to coat the trap when setting it. In nearly all parts of the world, animals know the smell of burned vegetation and smoke. It is only when a fire is actually burning that they become alarmed. Therefore, smoking the trap parts is an effective means to mask your scent. If one of the above techniques is not practical, and if time permits, allow a trap to weather for a few days and then set it. Do not handle a trap while it is weathering. When you position the trap, camouflage it as naturally as possible to prevent detection by the enemy and to avoid alarming the prey. Traps or snares placed on a trail or run should use funneling or channelization. To build a channel, construct a funnel-shaped barrier extending from the sides of the trail toward the trap, with the narrowest part nearest the trap. Channelization should be inconspicuous to avoid alerting the prey. As the animal gets to the trap, it cannot turn left or right and continues into the trap. Few wild animals will back up, preferring to face the direction of travel. Channelization does not have to be an impassable barrier. You only have to make it inconvenient for the animal to go over or through the barrier. For best effect, the channelization should reduce the trail's width to just slightly wider than the targeted animal's body. Maintain this constriction at least as far back from the trap as the animal's body length, then begin the widening toward the mouth of the funnel. Baiting a trap or snare increases your chances of catching an animal. When catching fish, you must bait nearly all the devices. Success with an unbaited trap depends on its placement in a good location. A baited trap can actually draw animals to it. The bait should be something the animal knows. However, this bait should not be so readily available in the immediate area that the animal can get it close by. For example, baiting a trap with corn in the middle of a cornfield would not be likely to work. Likewise, if corn is not grown in the region, a corn-baited trap may arouse an animal's curiosity and keep it alerted while it ponders the strange food. Under such circumstances it may not go for the bait. One bait that works well on small mammals is the peanut butter from a meal, ready-to-eat (MRE) ration. Salt is also a good bait. When using such baits, scatter bits of it around the trap to give the prey a chance to sample it and develop a craving for it. The animal will then overcome some of its caution before it gets to the trap. NOTE: Once you have successfully trapped an animal, you will not only gain confidence in your ability, you will also have resupplied yourself with bait for several more traps. Traps and snares crush, choke, hang, or entangle the prey. A single trap or snare will commonly incorporate two or more of these principles. The mechanisms that provide power to the trap are usually very simple. The struggling victim, the force of gravity, or a bent sapling's tension provides the power. The heart of any trap or snare is the trigger. When planning a trap or snare, ask yourself how it should affect the prey, what is the source of power, and what will be the most efficient trigger. Your answers will help you devise a specific trap for a specific species. Traps are designed to catch and hold or to catch and kill. Snares are traps that incorporate a noose to accomplish either function.